This site with breathtaking views has been a farm since 1903 and has recently become the much-loved home of two women in love with nature and the sheer beauty of this location. 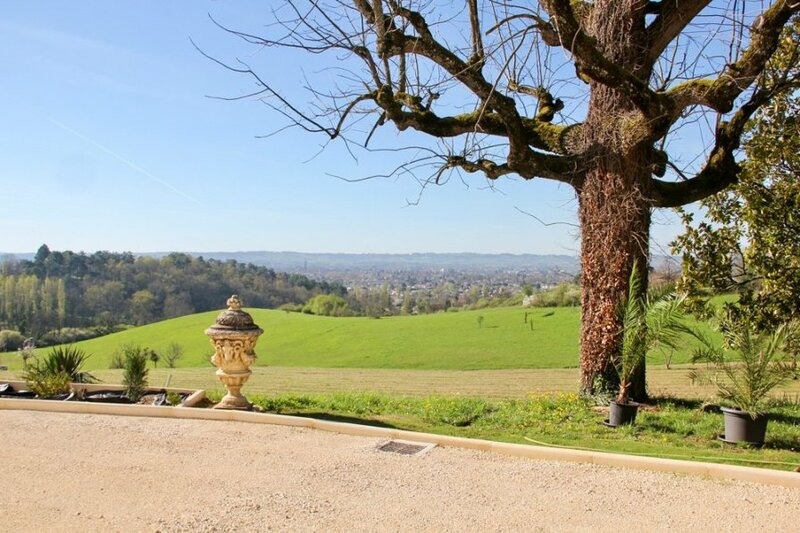 On top of a hill facing Bergerac, the estate has three hills which offer different views of the town. Up here it's all about silence, calm and retreat, but fabulous Bergerac is only a 5-minute drive away, so good restaurants, bars, shops and river sunsets are just a stone's throw away. The hostesses, keen to share their special idyll, have transformed an attached, independent and private cottage for guests and added a lovely heated pool for their exclusive use. The hilly grounds of 12 hectares are vast and surrounded by fields, forest, lawns and fruit trees. Children have plenty of space to run around, but there is also table-football and two adult bikes are available. The kids will love the Shetland ponies, chickens and pigeons which the owners feed every day. Around the estate there is a hiking path in the surrounding forest. Inside, the spacious cottage is comfortable, well-equipped and cozy. The fireplace makes it ideal at all times of the year. Jolie Ferme provides the perfect escape to a rural setting, yet near a famous town in the spectacular Dordogne, which is full of chateaux, vineyards and wineries, fine restaurants and historical sites. Jolie Ferme enjoys a fabulous hilltop location, surrounded by 12 hectares of stunning forests and fields, a real paradise for hiking and nature lovers. The ancient town of Bergerac is located just a few kilometres drive away from the villa. The town is characterised by its charming medieval features and original cobbled pavements. Boasting boutique shops, restaurants and pavement cafes it is most appreciated on foot. Situated in the renowned Dordogne, Bergerac is a real gateway to the surrounding wine region. Indulge in the famous Maison des Vins before exploring the countless wineries and vineyards in the beautiful countryside. During the summer months, the town is thriving with regular markets, concerts and festivals. The whole family will enjoy a boat trip up the river, with the opportunity to see local chateaux and typical French villages. Within the local surroundings, Bergerac has a whole host of activities on offer, including caves, castles, bowling, water parks and lakes, to name a few. So whether you're seeking a relaxing getaway immersed in a rural environment, or an action packed trip, Bergerac is the ideal town to accommodate all your desires. Furthermore, the closest airports are Bergerac and Bordeaux, with direct flights from the UK every Saturday.